How big is the market for a jacked-up car-based that has a steeper, less practical shape? Not very, apparently. Sales of what Automotive News and others call "crossover coupes" have fallen off of a cliff. These are models such as the unfortunate looking BMW X6, hideous Honda Crosstour and completely unsellable Acura ZDX, among others. Part of the problem might be looks of these hatchbacks with massive tires and cladding. The other problems might come from the fact few can see the purpose of these crossovers over things that really look like SUVs. When the Honda Crosstour was launched in 2009, Honda wanted to sell 40,000 of the Accord-derived all-wheel drive hatch per year. This year, despite a facelift, they'll be lucky to shift 15,000 of them. Sales of the X6 are off just about 10% so far in 2013, but it's unlikely to hit the 5,000 mark. Acura is already killing off the ZDX after four excruciating model years and despite making it less ugly for 2013, sales are down by almost half through September, at just 306 cars sold. Auto News' Mark Rechtin reported the impracticalities designed in these more wildly styled vehicles – bad visibility and access, less cargo room that cheaper, more practical rivals – has all contributed to them gathering dust on dealers lots. What this points to is that, while some of these models are in the middle or near the end of their life cycles, clearly demand has been low or completely fallen off of a cliff once everyone who wanted one bought one. The number of people who want something like an SUV but with a faster roofline and much less space inside is apparently small. This, however, isn't stopping more from coming along. BMW's already planning an X4, an X3 with less space. Mercedes is going to make an M-Class with a funny hat, and charge more for it. God knows what Mini has planned beyond the Paceman. 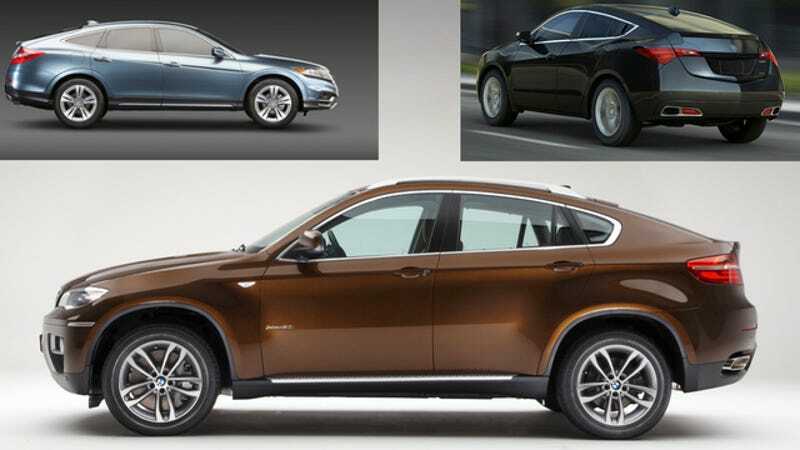 Will people who bought stuff like the Crosstour and X6 want another one in the future or are we nearing the end of the fad?